My roommate, Meaghan, is getting married and I am thrilled to be one of her bridesmaids. As soon as her matron of honor, Colleen, and I found out their honeymoon plans were leaning towards France AND we found cute little French plates while shopping, we knew we had our bridal shower theme. Honeymoon plans were later moved to Portgual, but I digress… the bridal shower theme stayed. The shower was a huge success. We had sparkling pink champagne, bridal bingo, polka dot decorations, and a fun, French-themed photo booth (always a favorite). Colleen flew up from Tennessee. We hung out with Ally for the second time in one week, which rarely happens. AND we had the chance to shower Meaghan with love. I wish I could take credit for any of the decoration ideas featured below. My biggest contribution was pinning ideas on Pinterest before the shower and placing decorations where I was told the day of the shower. Without further ado, if you’re looking to decorate a French-themed party, here are a few ideas. Table Centerpieces – Polka dot bandanas, tissue paper flowers, french plates, and Hersey kisses. Gift Table – Polka dot table cloth, paper banner, and hand-written thank you sign. Goodie Bags – “Merci” baggies with french sweets. Sweets Table – Cupcakes on sweet glass platters. And the best part of any party? Photo booth props with a nice background, featuring the bride and her bridal party. Spring is here at that means one thing: Baseball. What do I love about Spring? Baseball. Why? My mom loved the sport and passed that love to us. Growing up we spent many afternoons watching my younger brother play baseball or at minor league games. Now? I spend my Spring and Summer days watching the Orioles’ stats and making sure I get to at least a handful of games. I went to my first game of the season on Wednesday. We beat the Yankees 7-5 and won the series! (It could have been 7-3, but Tommy Hunter took that away. I digress.) In honor of our win, I present seven things I love about Orioles games. 1. Nostalgia. The game reminds me of family and I love that. 3. The Ketchup/Mustard/Relish race. It’s a nice way to get a few extra bucks when placing a quick bet with friends. 4. Chesapeake Waffle Fries. Who can resist fries covered in crap dip and Old Bay? Not this vegetarian. 5. Sunset views. Watching the sun set on the Baltimore skyline beyond the walls of the stadium makes for quite the Instagram-able photo. 6. Oriole Bird dances. Our Oriole bird is hilarious and I love watching him dance on the dugout during the seventh-inning stretch. Who doesn’t love a dancing Oriole? Holy Week is my favorite week. Holy Week is my favorite week. There’s something so beautiful about living life in the middle of a three day liturgy. The Lord always speaks to me in unexpected ways. I wasn’t able to make it to Holy Thursday mass this year, but I did spend time “watching in the garden.” I was bummed to miss the mass, but knew I was where I was supposed to be: being present to people I love. Sacrificial love was a Lenten theme for me this year, so it was fitting to begin the Triduum in this way. We typically hand things out in the neighborhood: cookies and rosaries during Christmas, jelly beans and Bibles during Good Friday. I usually have the lead on handing things out, as reaching out to people in the neighborhood is my favorite part. However, this year, I felt the desire to enter the walk in a spirit of prayer, so I let people handle the jelly beans and Bibles. I was amazed at how willing people were to take on this responsibility and how present they were. Every time I saw someone down the street that we should reach out to, someone already had their hands ready and filled with supplies. For me, that was the most beautiful part of the day. Later that evening, I gathered with a few friends to watch The Passion. This was my first time watching it with a group of people, as I usually ugly cry the entire time, and I’m glad I did. We joined together in prayer and reflection. It made the experience that much more powerful. 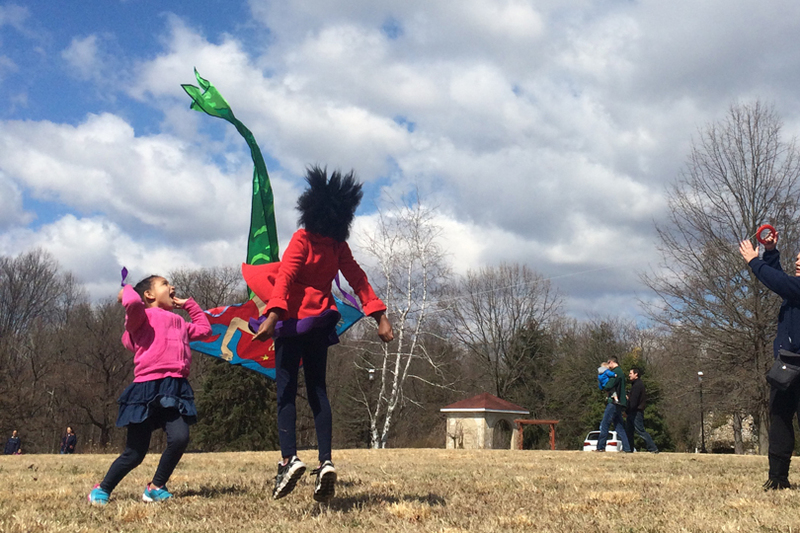 We kicked off Holy Saturday with an Easter egg hunt and perfect kite flying weather. That evening, I attended the Easter Vigil and watched my friend, Natasha, come into the Catholic Church. (The past four years, I’ve had the privilege of witnessing one or more friends enter the Church.) There is nothing more beautiful. My favorite part of the Mass is when the lights come on and we once again raise our voices together with an, “Alleluia!” Father was feeling particularly spunky that evening and would sometimes shout, “Alleluia!” to make sure everyone was awake. He is my favorite. Have you ever been part of a group that pulled together to bless friends with a ridiculously huge check? I have. It’s awesome and I highly recommend it. Thanks to our friend, Rebecca, organizing us, sixty-nine people joined together to raise over $16,000 so my friend’s growing family can purchase a van. We presented the check to them on Easter Sunday after Mass. Words cannot express the beauty of joining together as a community to suppor one another. 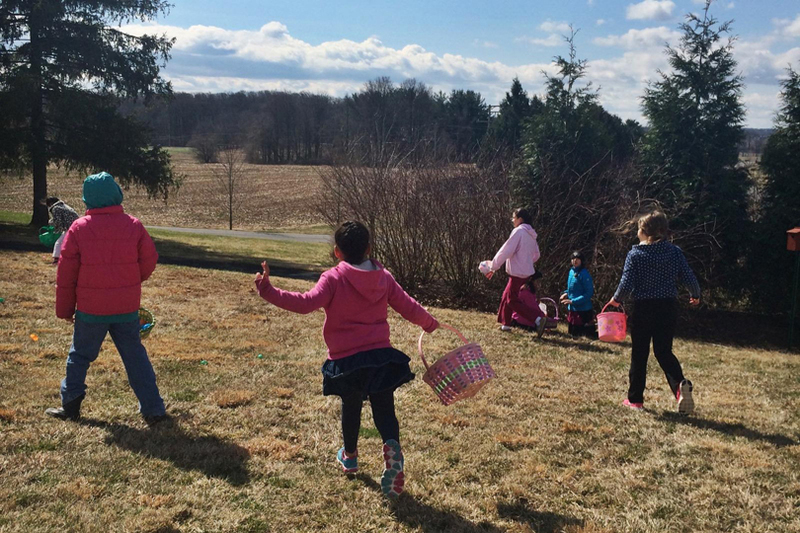 The rest of Easter Sunday was spent relaxing with my family and resting in the grace of Easter. In other words, it was perfect. I know I’m super delayed, but how was your Holy Week?